The endosperm constitutes the major seed storage tissue in cereals and aside from its role in supporting seed germination and early growth, it is vital as a food source in humans and livestock and has many industrial applications. Research in my laboratory focuses on understanding the essential trait of endosperm hardening during kernel maturation and its relationship to protein quality in maize. Maize is an incomplete protein source since its storage proteins are deficient in the essential amino acids, lysine and tryptophan. 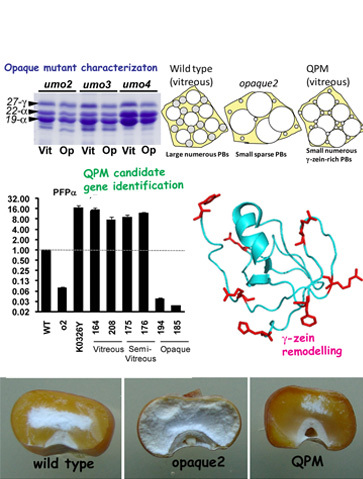 Maize mutants such as opaque2 reduce storage protein accumulation and their seeds can be used as a complete protein source. However, these mutants have soft, chalky kernels conferring undesirable harvest, storage and processing traits. 'Quality Protein Maize' was developed by selecting for genetic modifiers that restore the desirable hard endosperm texture in opaque2 whilst maintaining its high levels of lysine and tryptophan. My research seeks to determine the nature and mode of action of these modifier genes in order to simplify the further development and utilization of maize with improved protein quality. Also by characterizing a series of opaque endosperm mutants, we are generating a more complete understanding of the process of endosperm hardening during kernel maturation. Furthermore, we have developed a new platform for functional genomics analysis of maize and sorghum kernel maturation and protein quality. Investigating the nature, mode of action and potential applications of opaque2 modifier genes. We use transcriptional, proteomic and metabolic profiling as well as biotechnological approaches to study these genes. We are also mining maize diversity and conducting a mutagenesis approach to identify QPM genes.